How is galactic redshift related to galactic age? Higher redshift (larger z) means larger distance means younger galaxy. thanks for the nice pointers. I hope you continue to watch at and comment on this discussion closely, this is most interesting. 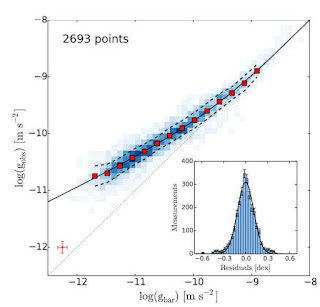 The authors of the 2nd paper make a few bold statements based on only 18 simulated galaxies in a very limited mass range using a single algorithm. Interesting to see how far they go out on a limb ... I also liked your comment "If the parameters were previously chosen so as to match observations already, then this result is hardly surprising." I think this highlights a problem in modern astronomy. Who from the outside can really judge what a specific simulation does, what errors is includes, what assumptions, what parameters were adjusted to get pleasing results? I guess proper rotational curves can only be obtained for the nearest galaxies? At least the SPARC galaxies observed are all within a range of 128Mpc and I guess the redshift z even for the farest of them is way too low to analyze if there is a z-dependency on the g_obs/g_bar relation? That fails versus z. Massive central black holes seed galaxies. Early massive metal-deficient stars rapidly evolve into black holes. Later metallized stars are smaller, giving abundant neutron stars. Dark matter is primordial and hot with no mechanism to radiate or absorb, with only gravitational interactions. Galaxies irreversibly scavenge dark matter in deep gravitational wells over time. Distributed dark matter monotonically declines locally and overall. It is worse if dark matter self-annihilates into photons. In the abstract of the "La Fin du MOND?..." paper, use is made of the phrase "dissipative collapse of baryons". Now I believe that the word 'baryons' is a reference to ordinary matter, but what to make of the phrase 'dissipative collapse'? Googling 'dissipative collapse of baryons' only provides links to various research papers where the use of these words is already understood. So what does "dissipative collapse of baryons" mean? Also, in your definition of dark matter, you describe it as "a pressureless, cold fluid". Is the condition of 'pressureless' a consequence of the fact that dark matter, in addition to possessing little capacity to interact with ordinary matter, also has (apart from gravity) little, to no, self interaction? Thanks for reading my paper :). The simulations this paper used, the MUGS2 sample (see https://arxiv.org/abs/1505.06268 and https://arxiv.org/abs/1604.08244) cover about half the dynamic range of SPARC (in dex, much less if you calculate overlap linearly). We went out of our way in these simulations to NOT tune any parameters from the top-down. Our model for supernova feedback is based on known, small-scale physics, rather than simply trying to tweak until the galaxies look correct. There was no guarantee when we started MUGS2 that things would come out looking good, and in fact, one of the big results we have is that for galaxies larger than our own, supernova cannot regulate star formation (more evidence that feedback from SMBHs is dominant for massive galaxies). As for the standard "LCDM problems", like DM cores, missing satellites, etc, there have been a number of studies in the last ~5ish years that have started to show that baryonic physics (feedback from stars, collisional collapse of gas) need to be taken into account to actually understand what LCDM predicts. 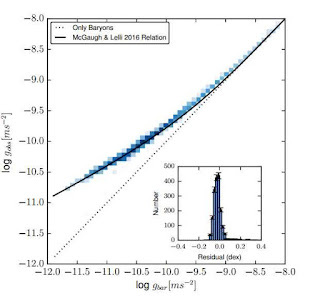 It's not yet conclusive, but simulations like APOSTLE (https://arxiv.org/abs/1511.01098) show that LCDM does predict DM cores, if you include feedback from massive stars in your simulations. Thanks for the explanation. I don't doubt that. It's just that, well, I know some things about model building, and I know that if you're looking to explain something 'naturally' you will eventually find a way to do it. So, I'm pretty sure that you are right that adding the right combination and right amounts of baryonic physics can explain all the data. But there's confirmation bias and post-selection in this model building. How many models have been tried before one worked? Theorists have much more freedom in their hypothesis tinkering than experimentalists. In the end, the only thing that helps sorting out models is making predictions. Hence, I appreciate you made a prediction and I hope it can be tested. with your simulations on this point? Millenium I think is dark matter only, doesn't tell you anything about the baryons. "Higher redshift (larger z) means larger distance means younger galaxy." It means a longer lookback time to the galaxy, so a younger galaxy if compared to a galaxy at lower redshift if the two formed at the same time. The question might have been "How does one calculate lookback time from redshift". "Thanks for the explanation. I don't doubt that. It's just that, well, I know some things about model building, and I know that if you're looking to explain something 'naturally' you will eventually find a way to do it. So, I'm pretty sure that you are right that adding the right combination and right amounts of baryonic physics can explain all the data. But there's confirmation bias and post-selection in this model building. How many models have been tried before one worked? Theorists have much more freedom in their hypothesis tinkering than experimentalists. In the end, the only thing that helps sorting out models is making predictions." This is not necessarily a show-stopper. Climate models are similarly complex. * But there is a consensus (leaving aside the crackpots, as one should) on anthropogenic global warming, for example. But it took a long time. Climate modellers were also in a better position to get funding, because they could cite "impact". *I worked in climate modelling for a while. (In fact, one of my more highly cited papers (which admittedly is not saying much) was in this field.) When I started out (this was back in the early 1990s, when RAM was DM 100 per MB and a 1-GB disk was huge), a colleague told me that one was classified into a more advanced group if one had more than 100 MB of disk space. I remember thinking that that wasn't too much, even back then, until I realized that they were talking about source code. Similarly, I thought that a day of Cray time wasn't that much, until I realized that they were talking about just the compile time. Phillip is right. Sorry that I was sloppy there. Higher z doesn't necessarily mean the galaxy is younger, it means you look at a galaxy at a time when the universe was younger. This will on the average mean the galaxy is younger, but each single case depends on when the galaxy formed. D.G. Russell (2005), Intrinsic Redshifts and the Tully–Fisher Distance Scale, Astrophysique Space Science, 299: 405. doi:10.1007/s10509-005-3426-2, Springer Link. Best bet for looking at a large box like Millenium or Bolshoi would be either Eagle or Illustris. They don't have the resolution of a zoom-in though, so their might be some dynamical effects they miss (and definitely wouldn't be able to do some of the smaller dwarf galaxies from SPARC). I'm swamped with postdoc applications right now, so I probably won't be able to get much new science done for a few weeks. Hoping to get a followup to this brief letter before 2017 though! The preprint at https://arxiv.org/abs/1610.07663 is relevant to this issue. I hope that readers of this blog find it useful. despite your efforts I am not sure I understand (or maybe there is too much smoke from various papers). Could the correlation mean that baryonic matter is actually "also dark"? (the only source term in the equations). If so (and if I understand..) it should be the only source of gravity terms except dark energy in the Friedman equations. Would that be a big blow to the big bang scenario? Ah, there we go: similar analysis, done with EAGLE. General agreement with my paper, interesting that they don't see a redshift dependence though! It will be fun to tease apart the differences that lead to this. No, this doesn't mean that baryonic matter is also dark. It's roughly as follows: We know there's a discrepancy between the acceleration of stars in galaxies and the total baryonic ("normal") mass in these galaxies. Leaving aside otherworldly speculations, there's basically two ways to explain that a) there's some stuff in the galaxies which is non-baryonic and hard to see ("dark matter") or b) General Relativity must be amended at this scale. The current consensus is a, the competitor is b. The benefit of a is that you can fit with this pretty much anything because it's a very flexible model. The benefit of b is basically the opposite, it's a very unflexible model but still it seems to get much right. Otoh, b doesn't seem to work well on scales of clusters, or at least it isn't understood exactly how. John Moffat claims everything works. Now in the above mentioned paper the authors claim basically that in a numerical simulation they've done, a also reproduces some of the correlations of b. Problem is, they use a numerical model which has been produced to the end of generating galaxies that look pretty much like the ones we observe. And as Milgrom points out in his paper (I didn't know) not even that is the case. This leaves you to wonder how much went into the simulation. Ben Keller above says it's just baryonic physics. I don't actually doubt that. It's just that if you've ever had anything to do with astrophysics, you know that there isn't any such thing as 'just baryonic physics'. This isn't the standard model. There's lots and lots of assumptions about how and when stars form, or collapse, or supernovae blow up, and what their magnetic fields do, and so on. It's highly complex (partly even chaotic) physics, many-body, which you don't compute like, say, a Higgs cross-section, if you see what I mean. Many thanks Sabine for this long explanation. Please could you tell me what to read for GR modifications at this scale? Gravitation? Two black hole mergers had immediate equilibrium, small binding energy, no quantum or information anomalies. No frou-frou. Equivalence Principle (EP): The pendulum equation has no bob; Einstein's inertial elevator. Torsion pendulums have bobs. Their angular momenta are mirror-asymmetric pseudovectors. Einstein-Cartan-Kibble-Sciama gravitation: EP = true, achiral spacetime curvature. EP = false, chiral spacetime torsion, a trace vacuum left foot. Opposite shoes embed with different energies, vacuum free falling along non-identical minimum action trajectories. 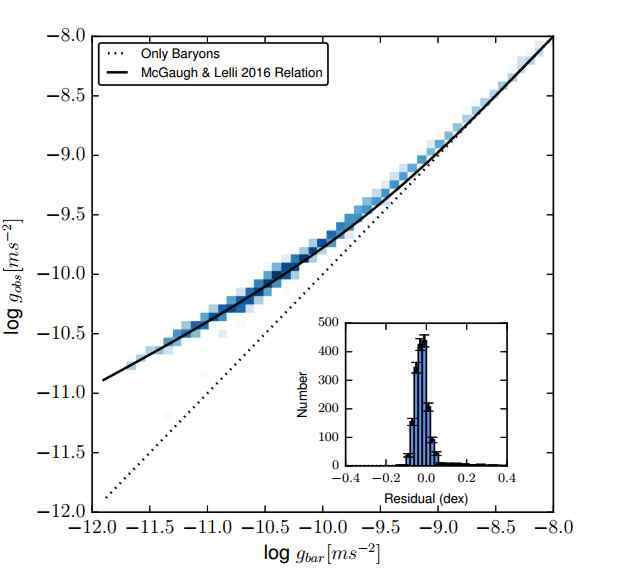 Divergence is baryogenesis and Milgrom acceleration, ~10^(-10) relative. Test masses are chemical (atom-scale geometry) not physical (composition, field). Resolving gravitation is empirically trivial but politically impossible. accelerations of Dark matter dominated systems is approximately constant (See Figure 3 of 1401.1146)? thanks for the reference; after reading it, I understand that a) and b) are competing because no-one solves the main failure of quantum theory and GR, which is to explain the existence of a big bang. In facts, all I see (in both cases) is an attempt to minimal progress; essentially modelling without new physical understanding (- but maybe I see what I want to see). What do you think? I guess this means that WIMPs and MACHOs are back in play, since axions are much more amenable to the high density, strongly coupled, low temperature scenario implied by coherence in the Lambda CDM concordance model as suggested by the rotational curves. That should make a whole lotta people happy. OK, maybe I see what I want to see. It can also be that gravity theory needs a complete conceptual reset! What I mean is that you would not name such horror (or beauty?) "modified gravity". 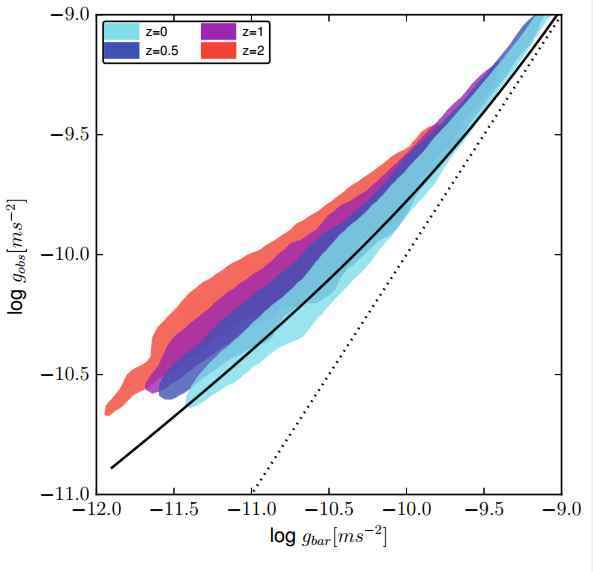 From the paper: "Also, while the slopes of the mass density profiles inferred from galaxy dynamics show consistency with those expected from their stellar content assuming MOND, some profiles of individual galaxies show discrepancies." "Some show discrepancies" is not the same as "fails dismally". Doc Hossenfelder says "Now in the above mentioned paper the authors claim basically that in a numerical simulation they've done, a also reproduces some of the correlations of b. Problem is, they use a numerical model which has been produced to the end of generating galaxies that look pretty much like the ones we observe." This and the other statements you're making such as the part of prediction in science, combined as they are with a willingness to cite your own record for case-in-point instances (e.g. your first hand experience of simulation work), begin to stand you out. Is anyone else doing that? I don't think so (if anyone knows pls say). I hope you commit to this. If you do, I will help you. Yeah, I'm pretty good at standing out, though not always for the best reasons ;) In any case, I haven't spent a lot of time on this topic. I happen to know that there's a philosopher of science who wrote her thesis on MOND vs CDM (and it's really MOND, not modified gravity), which I think is very interesting, though maybe for a physicist not quantitative enough. However, as I've said numerous times elsewhere, I don't think you can understand the philosophy of science without the sociology of science. In summary: it's a mess. There's no easy answer. Time will tell. There's a double-standard here. CDM fits galaxies only after a lot of parameter twiddling and tuning but then it somehow counts against a much simpler model if one of its approximations (please keep in mind everyone agrees that MOND needs a relativistic completion) doesn't immediately work out for all and everything. I find this very bizarre. "There's a double-standard here. CDM fits galaxies only after a lot of parameter twiddling and tuning but then it somehow counts against a much simpler model if one of its approximations (please keep in mind everyone agrees that MOND needs a relativistic completion) doesn't immediately work out for all and everything. I find this very bizarre." Indeed. I am on the fence about MOND. I think both sides overdo the rhetoric. But I'm on the fence because I don't know enough. Certainly the MOND people are not cranks, and my impression is that not only do they know more about conventional astrophysics than conventional astrophysicists know about MOND, they know more about conventional astrophysics than conventional astrophysicists know about conventional astrophysics. There is also the elephant in the room, namely bias on the part of the scientists. There is confirmation bias: write the paper if you can reproduce MOND phenomenology, otherwise tune your model more. Sabine has hinted at this. But there is also publication bias. "LambdaCDM fails to model galaxies realistically" is probably more difficult to publish than "MOND falls naturally out of LambdaCDM" (even if, in fact, it doesn't). Also, what do you show? Some sort of average? One of the strengths of MOND is not only some good fit, but also no scatter other than that explicable by observational uncertainties. The simulations need to show the scatter as well, not just the mean. And so on. I've just finished a book on MOND, by the way. Not because I'm convinced that it is true, but because I am still learning. What certainly is true is "MOND phenomenology". Whatever causes it, it has to be explained. It's not impossible, but saying that the simulations spit it out after millions of hours of CPU time is not elegant. Not that this means that it is wrong, only that it takes a lot of (not only CPU-) time to check. ing function and MDA relation. The above is consistent with G"
MOG theories works much better than MOND and this poses a problem to LCDM advocates since they are compelled to explain MOG results using very few parameters. I find MOG successes more of a menace to quantum gravity theorists since it demands extra particles or properties of the graviton complicating QG. In my opinion MOG theories are not favored by most physicists partly because of this aspect. I'm totally with you on that. There might be good reasons against it. But if so, I'd really like to see them. "I've just finished a book on MOND, by the way. Not because I'm convinced that it is true, but because I am still learning." A review will appear in due course in my series of book reviews for The Observatory. *Old joke: This summer, I plan to go to the south of France and finish my second book. I'm a slow reader. Elegant gravitation theory is untestable, parameterized untestable, or Yukawa potential always short an observed decimal place. Postulated mirror-symmetric universes suppress willful violation testing, Cox recanted vs. Yang and Lee (and Madame Wu!). Matter universes cannot be exactly mirror-symmetric (Sakharov conditions). Milgrom acceleration over time and space is treacherously effective. Both arise from trace mirror-asymmetric spacetime. Postulated spacetime geometry is falsified with test mass geometry (chemistry) in a geometric Eötvös experiment. Composition and field are inert. Pertinent test suites, qualified apparatus, and commercial test masses exist. Gravitation postulates "not the answer." Falsify the postulate, not derived theory. Observe the naked Emperor. Sabine sorry for the OT question. But are the videos of the QG symposium in Frankfurt a month ago online? No, sorry, they aren't. I know, I too find it annoying. Last thing I heard was that the editing turned out to be more time-consuming than expected and they've outsourced it and now who knows when it'll be done.